YearSum: Our shareware organizer for yearly tax receipts is available HERE , along with support files. This program has saved us many, many hours of time each tax season for over 20 years. Instead of giving your shoebox full of receipts to your accountant each year, use this neat little program to classify your receipts into one neatly printed summary of the years' expenses. Just enter your expense categories once. Then use the very easy and quick data entry method to enter amount, category and description. The program is written in VB.NET and uses an Access database and Crystal Reports for output. The file YearSumSetup.exe will install all of the needed components, except the .NET Framework, which most newer PCs have pre-installed. Download Dotnetfx.exe if you need the 1.1 version of the Framework. This is a 30 day trial of the product. For a mere $10 you can have the full license! Please remit to PayPal: bob@fischersci.com. Thanks! Recently we have been asked to research and implement B2B (business to business) commerce tools. These systems automate many of the back office functions such as order entry, purchasing, receiving and QC. The return-on-equity (ROI) for such systems makes them very attractive for any business which finds itself bogged down in the administration of its normal procurement processes. In a totally different field, one of our recent projects was produced for a client in the Middle East who wanted to create a virtual firing practice range. Scenarios are projected onto a screen ranging from hostage take-overs to fixed bulls-eye targets. Each user is given a gun which is the functional equal to its fully firing counterpart, only with out system it is also fitted with a laser and a recoil simulator. The timing of the firing is measured by computer, and accuracy is measured by feeding inputs from cameras located on the range. Proprietary software decomposes the images of the targets and calculates a score. We designed and built a complete prototype of this system, including all of the mechanical machining, control panels, special membrane keyboards and displays, computers, dedicated microprocessors for data collection, video interfaces and gunsmith work. The software was written in C with major extensions for video libraries. The system is now in full production by our client. A rail track stress remote measurement device for flat wheel detection for CSX Rail Systems using strain gauges and PC data collection with automated reporting functions via modem. Control design/implementation of a rail resurfacing machine for Speno Rail Services, the largest grinding machine in the world at the time of its kind. This train resurfaced rail 'on the fly' by using 125 large motors located on 4 cars, each motor positioned by computer control to optimize the grinding angle and force for the track conditions and speed of the train. We are developing an E-Mail Archival System which works in unison with accounting systems and a Document Management System. E-Mail is indexed as a project name and saved for retrieval along with other documents for that project. This system will provide Sarbanes-Oxley compliance for any sized company. We are currently marketing an automobile parking lot control system. The system is PC based. It issues tickets from a fixed menu of daily, weekly, monthly and non-standard ticket types. Tickets are printed on standard ticket stock on a thermal printer from Boca Systems ( www.bocasystems.com ). 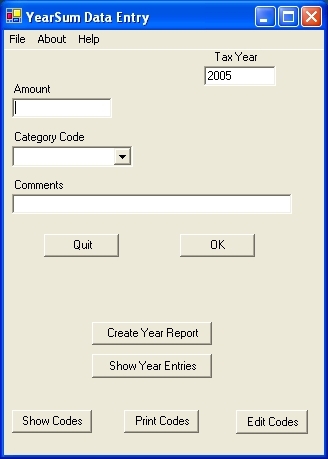 Transactions are logged into an Access database. The database is password protected, and the program has a three level access control structure for further security. Barcodes are used on the tickets to facilitate the check-out and overstay reconciliation process. Reports are generated at the end of each shift to keep track of shift activity and gate proceeds. This system has been in use for six years at our clients very busy location, and has returned a 100% increase in revenue in the first year, while cutting down on operating requirements and providing more reporting functions for management. The overall operation is faster at servicing the peak demands on entry and exit from the gate, and had made life much easier for the people who run the parking lot.